A Very interesting wiring kit here. For $1100 I would want something that is concours correct, but it's a good alternative for cars that don't have a harness. 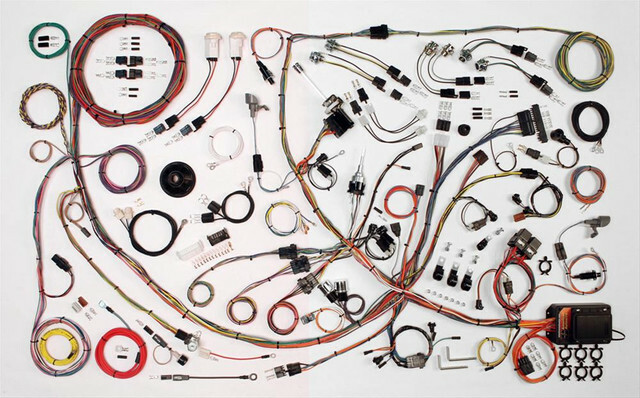 I would love to rip the guts out of my stang and upgrade all the wiring, but damn, that's a crap ton of work. Maybe one day when its all blown apart to paint I will get to that. It would be great to have some modern fuses and wiring. I actually have this kit. My car is completely stripped for a restoration and this option is much cheaper and easier than getting someone to make one up. Actually, I do, but I'll keep quiet. (04-12-2019, 04:05 PM)CobraJet351 Wrote: I actually have this kit. My car is completely stripped for a restoration and this option is much cheaper and easier than getting someone to make one up. You should have sent your harnesses to Midlife, a forum supporter and advertiser, for refurbishing. All circuits would then be easily traceable with the original circuit diagrams. +1 on midlife, best $$$ I've ever spent! I messaged Midlife a while back and this turned out to be a better option. Keep in mind that I’m in Australia so that creates another issue. This kit was the easiest option for me personally. I can easily install it myself. I don’t know how it is in America, but over here good auto electricians and insanely expensive. Getting one made up would cost a small fortune, more than twice what this kit is worth. It works for me but I can’t speak for everyone though. (04-16-2019, 05:50 AM)CobraJet351 Wrote: I messaged Midlife a while back and this turned out to be a better option. Keep in mind that I’m in Australia so that creates another issue. Did you actually install this already? Any comments on the quality? Are the wire colors correct? I'm going to replace mine eventually as well and though I recognise Midlife's good reputation this is certainly another option.